As a member of CoinFabrik, during the last year I dedicated myself to teach about Ethereum for the University of Palermo and given what I saw in my classes I required a set of tools that allowed me to observe and quickly analyze different situations in relation to Ethereum. This was from analyzing the problems of a Node and its connection to the rest, passing through studying a particular blockchain, to seeing how the different transactions of a smart contract behaved. In view of this, and due to the material conditions of the work, I required an environment where students could do all that but at the same time didn’t need to be connected to the internet. That is why I ended up configuring my personal computer to have those tools. However, the configuration of my computer was not portable enough for the needs I had. This motivated me to create a rapidly configurable environment using Docker and Docker Compose as main tools. This article will describe how to use those tools. It is necessary to clarify that the configuration of the dockers was developed together with PeGa! (our SysAdmin) who helped the project to be in optimal conditions. The software described below is intended to be a tool of both educational and development environment purposes. The purpose of this configuration is to generate a Docker environment of 2 nodes connected together (a.k.a. Node1 and Node2) running on Geth and monitor them using Ethstat (at localhost:3000). Then we can use MetaMask as well as Remix to connect to Node1 (localhost:8545) to send simple transtractions, like sending Ether, or complex transactions like the creation or call of a smart contract. The Geth services are running in pm2 so if you want to see the logs of the nodes, you must first attach to the node and then inspect the log. will send the amount of ethers in the first parameter to the address specified in the second. In order for the transaction to actually take place, we must start the mining process. These commands will send the Start and Stop command to the Node1 container but, because the two nodes are connected and synchronized, we can see in the Ethstat panel (localhost:3000) that the two nodes are holding the same blockchain. 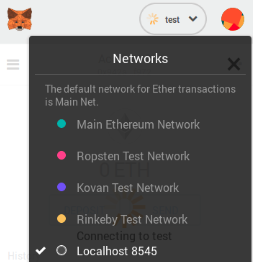 To connect with MetaMask we select the “localhost 8545” option, whereas the connection from Remix to Metamask is done by selecting “Injected Web3” in the Environment option.